Cracker, the Bull Terrier, was one of Aldin's very favorites. Cracker, the Bull Terrier, was one of Aldin's very favorites. Cracker and Mickey, the Irish Wolfhound, were great friends and Aldin describes them helping each other according to their talents. Cracker, with his powerful jaws, would crack bones for Mickey and Mickey would use his height to reach things they wanted. 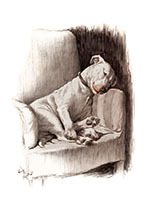 From a book entitled The Artist's Models 1930, which was a collection of some of the commissioned portraits of dogs that Aldin had done over the years. 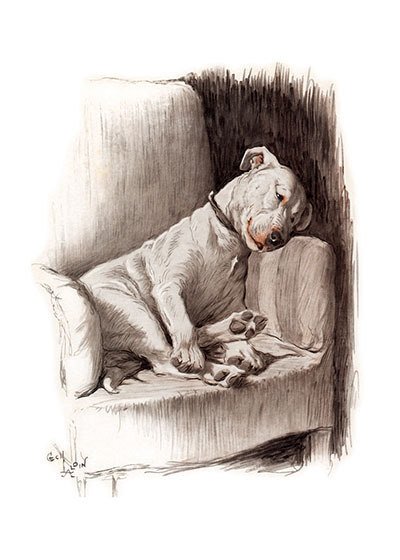 People would leave their dogs with Aldin for a while, in which time they became part of the household and gave Aldin an opportunity to study them and thereby create portraits which winningly reflected their personalities. The excellence of these portraits made Aldin much in demand as a pet portraitist.